Where can I buy books published by Third Editions? 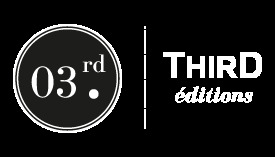 You can purchase books published by Third Éditions directly through our website: ThirdEditions.com. Our books are also available through the more traditional channels, at bookstores and specialist outlets, as well as on various retail websites, such as Amazon and others. How do I pay through your website? To serve our readers as best as possible, we have decided to offer the widest range of payment methods we can: Card, PayPal and check. You will be kept informed of your purchase by email at every stage, from order and dispatch to receipt. Packages are shipped through a third party. However, this will not prevent us from ensuring that our readers receive their orders. If, after a reasonable amount of time, you still have not received your order, you can contact us by filling in the relevant form found in the After Sales Service section. Shipping costs are beyond our control. This amount does not go to us; we do not make a profit on it at all. We only apply the rates set by the carriers with which we have partnered. We have, however, endeavored to offer the widest variety possible so our readers can choose the offer that best suits their needs. Which carriers deliver the packages? As we want to give readers a huge choice, we have been careful in suggesting a large selection of carriers to deliver the orders. You choose the one that is right for you. We are also committed to offering deliveries at agreed pick-up locations, which may be more cost-effective or practical. Can I order Third Editions publications from abroad? You can order our books from anywhere in the world. Delivery times and shipping costs will depend on the country of destination. I pre-ordered a product at the same time as buying an in-stock item. When will I receive them? Our premium members can pre-order books before their release. However, you should be aware that, if such an order includes products that are already released, the order will not be dispatched until the pre-ordered books are available. Nevertheless, we will make every effort to only offer pre-orders for books that will be available within the month following the order. Why are « Collectors » editions more expensive than standard editions? Quite simply, their production is more costly. “Collectors” books have a limited print run of only a few hundred at most. Such limited productions do not allow us to take advantage of the economies of scale. Furthermore, we add little extras to garnish these special publications, such as hot foil stamping, specific embossing or lamination, which increase production costs. As a result, the retail price is slightly higher for “Collectors” editions.